Their romance caused major political and diplomatic ructions. 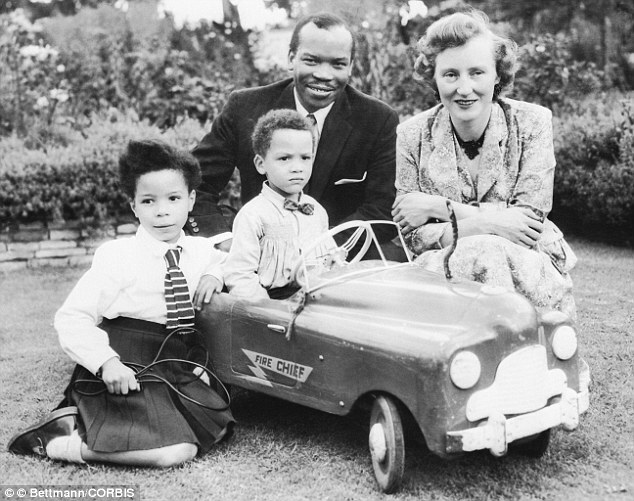 But the extraordinary love story of the late Botswanan president Sir Seretse Khama and his middle-class white English wife Ruth Williams endured despite all the obstacles and outrage. Now it is being told for the first time on the big screen. 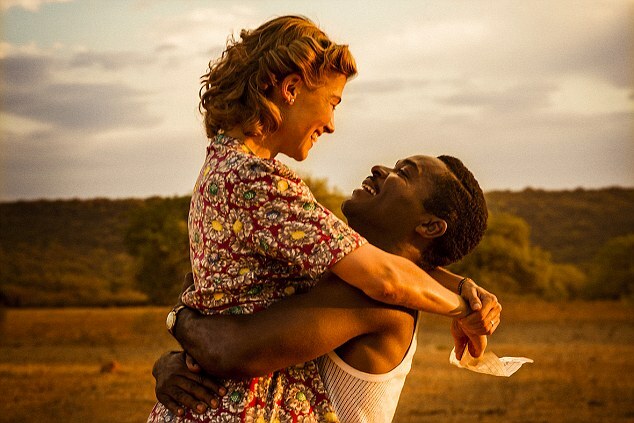 British stars David Oyelowo and Rosamund Pike are portraying the pair whose relationship became the focus of a crisis between Britain and Botswana’s neighbour South Africa, which was about to introduce apartheid. Seretse was the Oxford-educated student prince from the British protectorate of what was then Bechuanaland who in 1948, at 27, married Ruth – a 24-year-old clerk with a Lloyd’s underwriter. Their union was fiercely opposed by her father and Seretse’s family. He was chief in waiting of the Bamangwato tribe and had been sent to London by his uncle Tshekedi Khama to study law, after which he was to return home and marry a woman from his tribe. Ruth Williams was born in Blackheath, South-East London, the daughter of a former Indian Army captain who later worked in the tea trade. She loved jazz; so did Seretse. They met when Ruth’s sister Muriel took her to a London Missionary Society dance in 1947 where Seretse asked her to dance. It was a whirlwind romance. Seretse didn’t seek consent from his uncle because he knew it would be denied, but Ruth had to ask her father George, who argued that she should not marry a black man. But she ignored him. Pike told the Daily Mail: ‘Ruth’s fear was telling her father, because she knew it was going to be a hurdle. Apartheid was about to be enshrined in South Africa, and Britain was reluctant to damage relations with that country. ‘South Africa made strong representations to the British government that if they were seen to condone the marriage of a white woman to an African, there would be a Commonwealth and constitutional crisis,’ said Pike. While this was going on, Seretse’s uncle Chief Tshekedi also insisted that the Colonial Office prevent the marriage. A parson who was meant to marry the pair was told in no uncertain terms he should not officiate at the wedding. The ceremony didn’t go ahead – but the couple married secretly at a register office instead. The following year they returned to his tribe in Bechuanaland, thinking their problems were over. But Tshekedi was enraged and summoned tribal elders to a meeting, at which blood relatives of Seretse opposed the marriage. They said Ruth would not be recognised as tribal queen. But Seretse and his supporters realised that Tshekedi wanted to be king himself. A second tribal meeting, known as a kgotla, was held and all but nine of the 4,000 present backed the devious uncle. Meanwhile, furious telegrams were being sent between the UK and South African governments, with Pretoria insisting the marriage breached race laws. The South African prime minister denounced the union as ‘nauseating’. With his young wife now pregnant, Seretse was invited back to London to meet Commonwealth Office ministers while Ruth remained in Bechaunaland. It was a trap. The couple had a daughter and three sons, one of whom, Ian, is now president of Botswana. 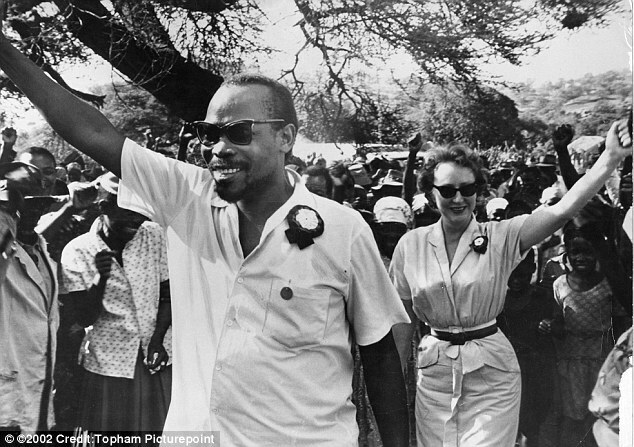 Seretse died in his wife’s arms aged 59 in 1980. Ruth died aged 78 in 2002. The forthcoming film has all the attributes – major actors, important director, explosive and compelling story – of a movie that will attract audiences and, just as importantly, Oscar voters. It is due to be released late this year, in time for the next ‘award season’. For Oyelowo it’s a part that could land him a coveted Oscar nomination, an honour denied him two years ago when he starred as Martin Luther King in the film Selma. Oyelowo said that he was attracted by the ‘epic nature of the love story, and the backdrop of the British empire, and what it was like to be a king in Africa just as apartheid was being signed into law in South Africa’. With this year’s Oscars marred by claims that they are ‘lily white’ because not one of the 20 nominated actors is black, he told the Mail that when it comes to making films about the black experience ‘you’re either part of the solution, or part of the problem’. ‘There’s a lot of conversation about diversity in entertainment and media and one of the things that one mustn’t fall into is the trap of complaining about it, without doing anything about it,’ he said.